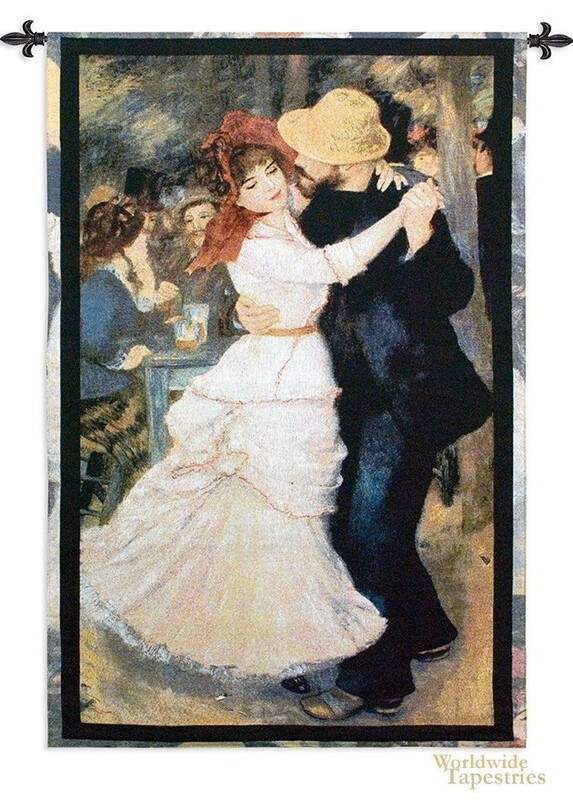 From the painting by Renoir in 1883, Dance at Bougival tapestry shows a romantic and lively dance. The model Suzanne Valadon was used for this work, who is seen here dancing in a party, a work that is a flurry of activity. The work of Renoir has a light French air about it and in this piece, the woman is seen in an elegant pink dress and striking red hat which together with the gentleman's yellow hat and ardent posture, draws attention right to the woman's face. This play of color and movement is typical of Renoir's works. This Dance at Bougival tapestry is backed with a lining and has a tunnel for easy hanging. Note: tapestry rod and tassels, where pictured, are not included in the price.